Use inventory counts to reconcile inventory, determine shrinkage and correct your inventory counts. You can do either full or partial counts. NOTE: An inventory count cannot be imported or merged to another count. Special orders, layaways and work orders Items set aside, such as special orders and layways, are not included in inventory counts. You count only the items you have in stock and ready to sell. Full count If you want to count all your inventory, it's important that you do it all in one count so that any products you miss in your count appear in the Missed list. Items in the Missed list are items that you were not able to count. You'll want to deal with these items by finding out why you missed them and entering a count for each item or zeroing them out by clicking Missed in the left menu. Spot count If you count only a section of your inventory, the Missed list is not as important, unless your inventory is organized by categories, tags, or brands. You can filter on these fields within the Missed list of the Inventory Count. Having your inventory organized is important, as it helps you find items you missed within the inventory section you are counting. If your inventory is poorly organized, the Missed list does not help you find missing items. From the main menu, click Inventory > Inventory Counts > +New Inventory Count. Name your count. We recommend that you name the count based on the situation and time of year, for example Fall 2010 Count. If you have a multi-store account, select your shop. NOTE: Once you add items to your inventory count, you can no longer change the shop you selected. Do your count with a scanner or with printouts. To count with a scanner, make sure your cursor is blinking in the Item Scan/Search field, on the right side. Scan each item you want to count. To count an item twice, scan it twice. Enter a number from 1 - 99 after you scan an item to set the item's count. For example, scan an item, type 80 and press Enter on your keyboard. If you're unable to scan an item, do an item search and add the item from the list. 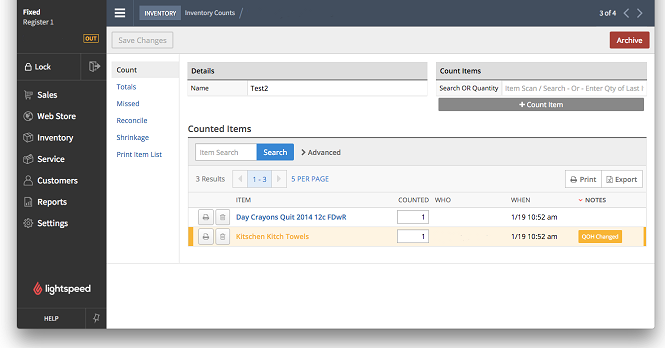 To count using printouts, on the left menu of the INVENTORY COUNT page, select Print Item List. To print a list of items to count, select a Sort By option and a list of the items is displayed. Using the printout, mark the quantity of each item in the Count box. When you're done counting, return to the computer and select Print Item List. Enter the ID from the printout, pressing Tab to move from field to field. Within the Inventory Count, on the left menu click Missed. This list displays the uncounted inventory items. Some items may not have ever been counted and others may not have been counted because they are missing. Items in this list will have no inventory adjustments. If you're doing a partial count of a few select items there will always be items in this list. You can set all the items in this list to have a count of zero by scrolling to the bottom, choosing the checkbox to select all the items, and clicking the Zero Selected Items button. This sets their inventory levels to zero when you reconcile. Reconciling is when you change your inventory records to match your physical count. Be careful when performing this function as it adjusts your inventory records for all counted items. When you're sure the list is accurate, reconcile your inventory. On the INVENTORY COUNT page, on the left menu click Reconcile. When you're certain that your counts are correct, click the Reconcile Inventory button. After reconciling, on the left menu click Shrinkage to view how much inventory was lost due to shrinkage. NOTE: Inventory counts measure discrepancies in inventory levels. Sales or added inventory do not change your shortages. For example, if you find that you are short 2 hats, your adjustment will be -2 to quantity on hand for the hat. That doesn’t change as you sell items or receive purchase orders. The quantity on hand is still off by -2. After you complete your count, if any items are highlighted in yellow with a QOH Changed button, it signals that the inventory has changed after you entered the count for the item. This can be any sort of change, such as a new sale, purchase order, transfer or manual adjustment, so investigate what the reason is if you're not sure why the quantity on hand changed. If you're doing a count for a multi-store, the change is for the store you're doing the count for.